This month there are many things inspiring me, but one that really catches the eye is the arrival of contemporary Korean art from 33 artists including Debbie Han, Seon Ghi Bahk, Ji Yen Lee and Myung Gyun You at the Saatchi Gallery to coincide with the Olympic Games. The exhibition presents the largest survey of new Korean art to date, and highlights an exciting group of artists who have recently emerged on the global art scene, producing work that provides an arresting insight into the future of contemporary art in Korea. The show begins on 26th July, but if you pop into the gallery now you can see a taste of Korea coming through. Intricate oil paintings on aluminium surfaces by Hyung Koo Kang really draw you in, and beautiful 'translated vases' by Yeesookyung are growing in the lower gallery spaces. 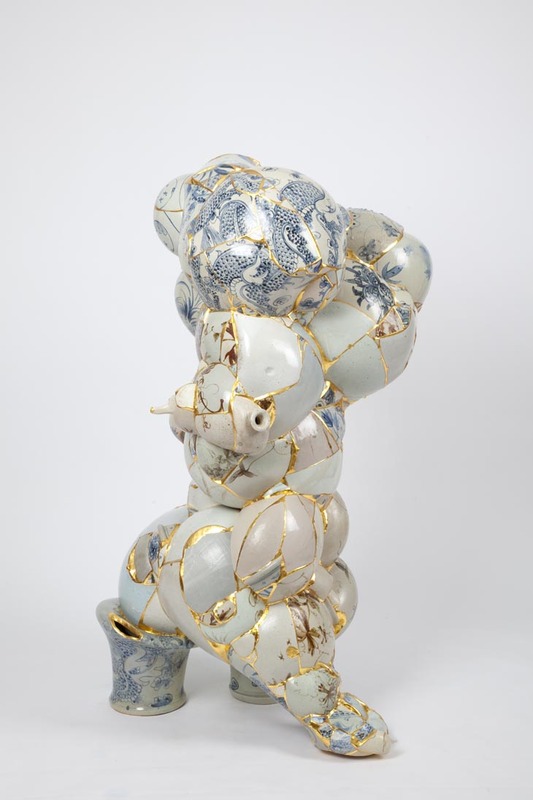 Made from 'ceramic trash', Yeesookyung's uncanny and bumpy objects have organic, bubbling forms featuring fragments of Korean patterned vases joined in a frankenstein-like manner to make new, growing forms. A network of fine gold veins stretches across the surfaces where the epoxy and gold leaf joins each vase piece to the whole. Yeesookyung says "I took ceramic trash from a ceramic master who reproduces old Korean ceramics such as Joseon Baekja or Celadon. After baking in a kiln by using the old method, ceramic masters break almost 70 percent of the porcelains that don't reach up to their standards of masterpieces. I put the broken bits and pieces of ceramic trash together one by one as if I'm putting together a jigsaw puzzle. And I cover the seams with 24 karat gold leaf. 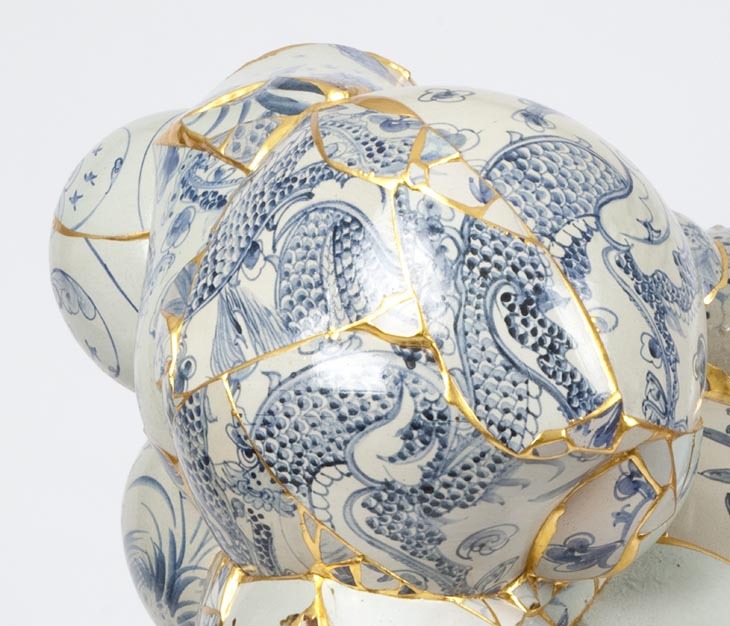 Each broken piece operates as a self forming into an infinite proliferation toward as unexpected fabrication--fictitious loquacity and stuttering discards from standard conventional masterpieces." will be the very first time this group of artists have shown their work together, demonstrating a very diverse range of influences including fluency with technology, incredible attention to design and detail, and more historic factors, such as western classical art and Korea's many years of occupation by foreign powers. 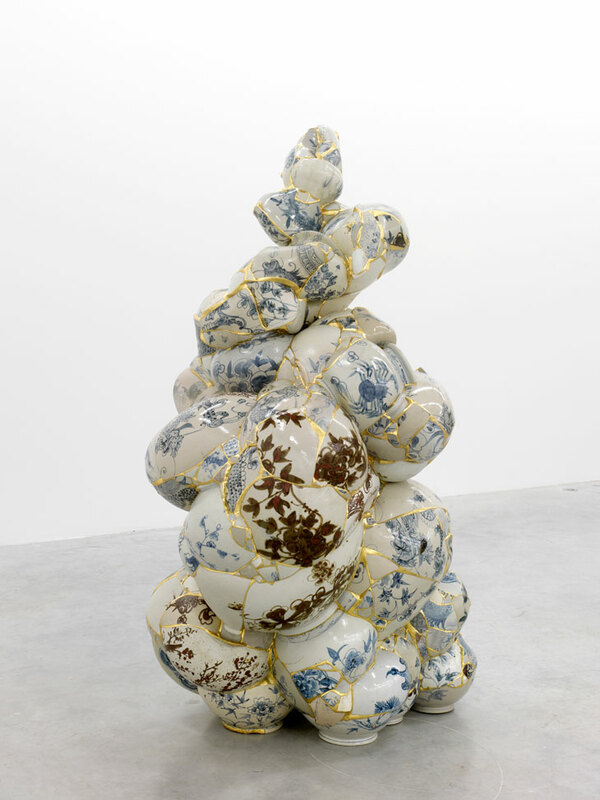 It will also be the first time the Saatchi Gallery has helped curate an exhibition of this scale from work outside its own collection, selecting the final 33 artists from Korean Eye's long list of 2000 artists who entered over 28,000 works for consideration.